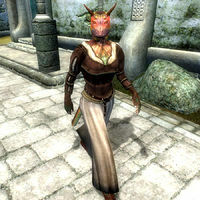 Quill-Weave is an Argonian acrobat living in Anvil, who offers basic training in Acrobatics. She is a famous author who writes stories about the adventures of outlaws and low-lifes in her books, such as "Red Crater" and "The Goblin with the Golden Arm". One of her neighbors keeps rats as house pets, and during the related quest, you will find out exactly how much that bothers her. Quill-Weave is currently working on a series of books named after Cyrodiil's Doomstones, though she believes that the Doomstones have no magical powers. Regardless, she will spend a lot of her time inside her residence, from 6am until she goes to bed at midnight, just wandering around, thinking up new ideas. At midday, and again at 6pm, she will leave the house for a two hour meal at The Count's Arms. Even though she is never actually seen writing, a shopping list on her desk reveals that she uses up a lot of writing materials, and as a result she'll have to pay a visit to Lelles' Quality Merchandise on the Anvil Dockside every day at 4pm and stock up on her supplies. As busy as she may look, she always has time to train you, except when she's asleep. On Loredas and Sundas, she'll keep doing her regular routine, but will break it off at 7pm, take the short walk up to Anvil Castle and attend Countess Millona Umbranox's formal dinner. She leaves at 11pm, and heads home and wanders around the house until her bedtime at 2am. As usual, she's available for training all day long, just not in the presence of the Countess. On the 7th of each month, she will get out of bed at 6am and start her long journey towards Chorrol to visit her good friend and colleague, Casta Scribonia. She will take the Gold Road all the way to the Imperial City, then head north on the Red Ring Road and then turn left on the Black Road towards Chorrol. After 36 hours of traveling, she will arrive there at 12pm on the next day. Once there, she will actively seek out Casta and follow her around to her various destinations, which include both the Chorrol chapter of the Mages Guild and The Oak and Crosier. Her departure time varies (see notes), but if she chooses to stay in Chorrol, she will sleep in Casta's bed between midnight and 8am. While on her trip and during her time in Chorrol, she will offer training 24 hours a day. Note, that if Casta Scribonia is dead, Quill-Weave will cancel the Chorrol trip altogether, returning to her normal schedule at 7am. When you reach stage 70 of the related quest, and Arvena Thelas finally reveals she suspects Quill-Weave for having some kind of connection with the mountain lions in her basement, Quill-Weave will change her behavior rapidly, and can now be found suspiciously wandering around the streets and backyards of Anvil 24 hours a day, ignoring both the dinner at the castle and the trip to Chorrol. If you follow her, you will notice, that at 8pm, she'll go into sneak mode and slowly move towards the barricaded hole behind Arvena's house. She will stay there, until she returns to the streets of Anvil at 2am. If you follow her around the house, she will lay down a piece of venison, and if you see her do that, you'll get a quest update, after which she will return to her normal schedule. As she skips all her appointments during this stage, she will offer you training for the entire duration of the day. Even though she's quite a well-known novelist, Quill-Weave wears a set of unpretentious middle class attire: a brown shirt, light brown linens, and quilted shoes. She carries around her house key and a considerable amount of gold. When you approach her for the first time, she will introduce herself: "My name's Quill-Weave. I've had some success selling stories about the lives of the lower and criminal classes." She will also give you a few hints as to where she finds her inspiration: "Between the sailors and shipmen of the port, and my little local circle of friends, I have plenty of yarns for knitting up my tales." During the related quest, she will deny Arvena Thelas' wild accusations: "I don't know what you're talking about. I'm not sure what you're accusing me of, but don't do it without any proof!" But when you catch her with the venison in hand, she will confess the whole thing: "You what? Well, I'm sure I don't know what you're talking about. I would never go skulking about.... Fine. You've got me. I figured if I left some rotten meat outside, the nasty little things would come out, and the guards would take care of them." If you tell her that her actions had certain consequences, she will be shocked: "Mountain lions! In her basement? I just wanted to lure her vermin outside! I didn't mean to hurt anyone, except the rats. Please, don't tell her! And, if you can keep this our little secret, I can make it worth your while. There's a bit about acrobatics I can teach you. Give it some thought." And if you chose to keep Quill-Weaves involvement a secret, she will provide you with a free lesson in Acrobatics and the following dialogue: "So, you didn't sell me out. I appreciate that. Well, I said I'd make it worth your while, so let me teach you a little something. You've got to be light on your feet to make it around here, and that's something I'm good at. Maybe you can be, too. Take care." And when approached after this, she will greet you with this: "Yes? What can I do for you, my tight-lipped friend?" If you chose to tell Arvena the truth, Quill-Weave will think very little of you: "What do you want, you... you... rat?" Quill-Weave is well-known as an author. The residents of Anvil may be overheard saying "I've never read any of Quill-Weave's writings. I've heard they're fairly good, though." and "Quill-Weave does a lot of traveling to research her books. She must have a lot of experience to share." Others will reply: "She travels a lot to research her books. She's in great shape from all that travel. Maybe she'd teach me a bit about getting into shape." and "She seems like a good person to talk to. I imagine she could teach me a lot." None of her books can actually be found in the game. Following the quest A Rat Problem, one of Quill-Weave's possible greetings is: "What do you want, you... you... rat?" The voice actor hesitates after the first "you" and restarts the sentence. As several AI packages are used to determine her actions during her monthly trip to Chorrol, Quill-Weave might return to Anvil as soon as she arrives, or stay for nearly a week, not departing before 12am on the 14th. The reason for this is that she has a return package telling her to return to Anvil on the 8th at 4am, but if you enter Chorrol or meet her there, her sleeping package in Casta Scribonius' house is activated, causing her to stay in town for nearly a week. If you leave Chorrol, her old return package is activated, and she will head back to Anvil. Also, if she is in Chorrol at 7pm on Loredas, she will hurry back to Anvil to participate in the dinner at the Anvil Castle.